Fabricio Werdum shocked the MMA world this past June when he handed Fedor Emelianenko his first loss in nearly a decade. While most would expect for him to launch a worldwide ‘Hey, look at me’ tour, the Brazilian has gone quietly into the night, and under the knife, to fix a nagging elbow injury that he’s dealt with for the last couple of years. The upset specialist wasn’t able to fully extend his elbow prior to the surgery and is hopefully the added range will allow him to expand his game. Improving is something the 33-year-old jiu jitsu wizard knows he’ll have to do, as Stikeforce continues to add to their roster. The San Jose, California based promotion’s latest signing was the talented – yet highly controversial – Josh Barnett. Although Werdum is excited about the prospects of facing the former UFC heavyweight champ and Affliction Entertainment destroyer, Barnett isn’t even on his radar at this point in time. He’s actually thoroughly intrigued will mulligans against two heavyweights he’s already made tapout. “I thought it was a great acquisition to the event. Barnett is a really tough heavyweight,” said Werdum. “ I haven’t thought about facing him yet. My goal now is either a rematch with Fedor or (one) with Overeem for the belt. But actually the most important thing for me is not who they will choose, but that my body is 100 percent recovered. 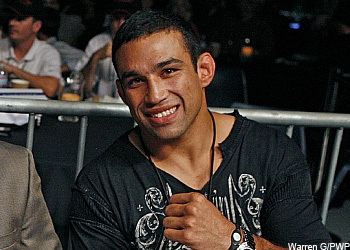 Werdum is expected to return to action in early 2011.